This was inspired by a Food Network recipe courtesy of Sunny Anderson and tweaked to our taste. Great heated in the toaster oven the next day. I used my mother-in-laws electric griddle so not quite so much oil as the deep fried ones. In a large bowl combine flour, cornmeal, sugar, baking powder, and 1 teaspoon salt. In a medium bowl, egg, milk, and vegetable oil. Pour into the bowl with the dry ingredients and combine. Allow to rest for 5 minutes. In an electric griddle 375 degrees, add just enough vegetable oil to coat the griddle. 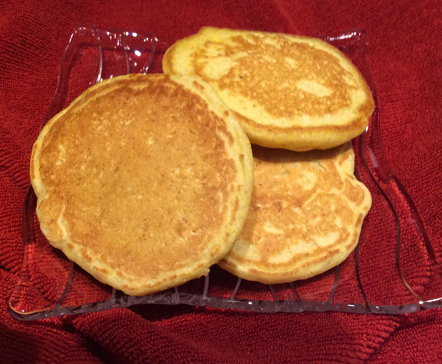 When the oil is hot, add the batter in batches to the pan using a 1/4 cup measure to make each hoecake. Gently spread into a circle, if needed. Flip the hoecakes when the air pockets begin to pop on the surface of the batter and a peek underneath the cake reveals a golden rim and surface, about 2 minutes. Keep hoecakes warm in the oven until ready to serve. These would also be good for breakfast with some maple syrup.